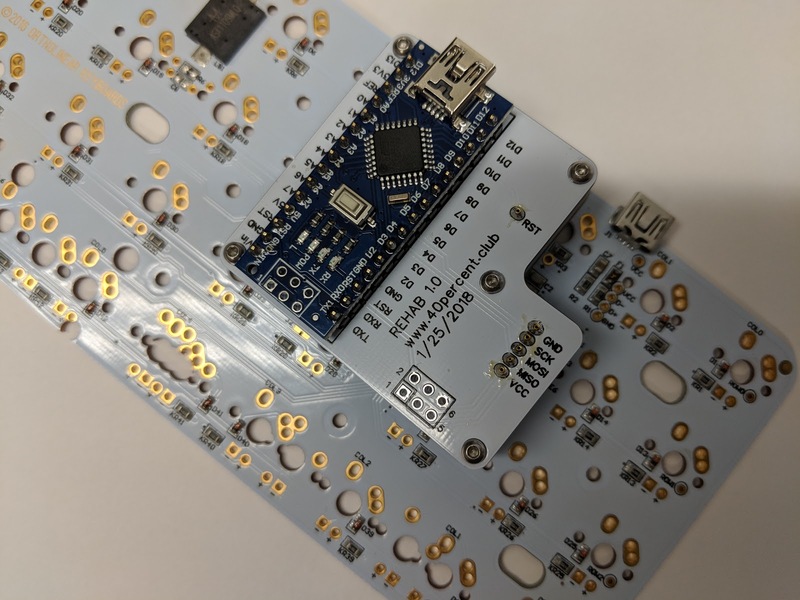 OLKB has released a custom LUFA bootloader that has audible and visual feedback when in bootloader mode. Newer PCBs come with it preinstalled. I have an older Rev 4 board that has a speaker but the old boring bootloader that does not click. I had previously soldered wires to the ISP pins on the Planck PCB to flash the bootloader. The Rehab uses pogo pins (like the Lobot) to make electrical contact with the same ISP pins without soldering. You could also use this to gain 4KB of flash memory for your compiled firmware by eliminating the bootloader completely. That would let you use the full 32KB, but lose the convenience of flashing via DFU. The Rehab is a Lobot with pogo pins in specific locations that match the Planck PCB. The P75 E2 pogo pins worked best. The larger T2 heads are close to touching with the tight spacing. The six ISP pins. Reset, Ground, SCLK, MOSI, MISO, VCC. 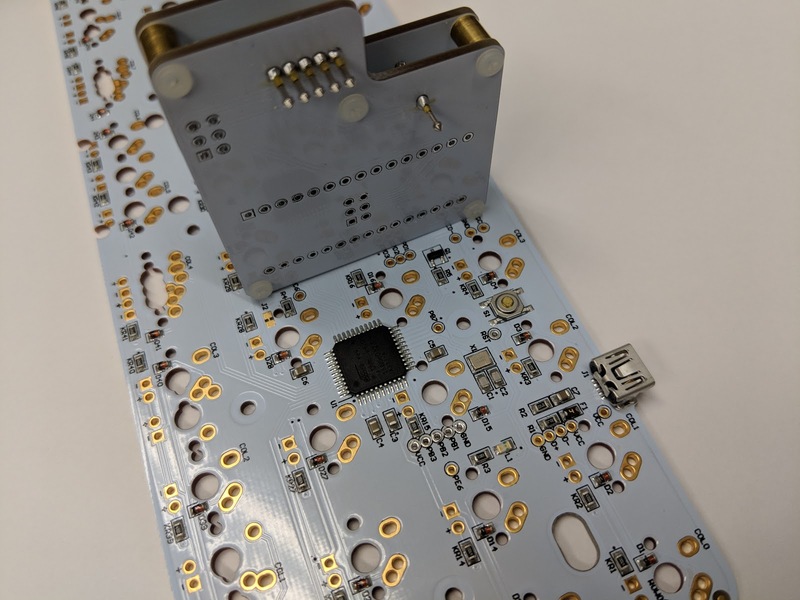 SCLK, MOSI, MISO are PB1, PB2, PB3 on the Planck PCB. I used 6mm M2 spacers and nylon screws on the bottom to prevent electrical shorts. 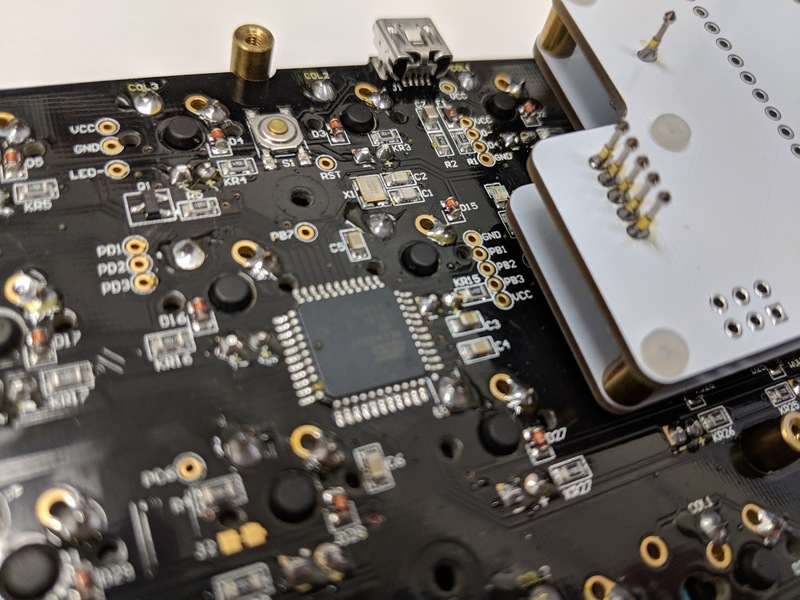 You'll need one hand to hold the Rehab in place against the solder pads while running Avrdude with the other. I also tried this with a Rev 2 PCB and the positions of the ISP solder pads were the same. 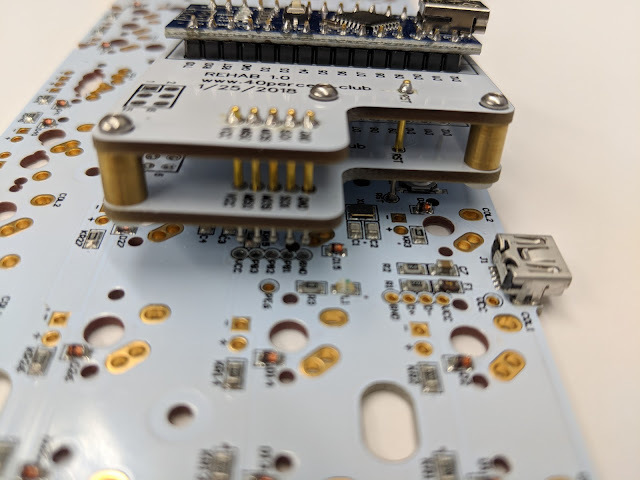 I do not know if the Rev 5 or Preonic PCB will work, but from the pictures I have seen it looks like the ISP pins are in the same location and spacing.